Yes, I am a lone traveler! In fact, I have been doing it for seven years already. And I guess it will always stay that way. 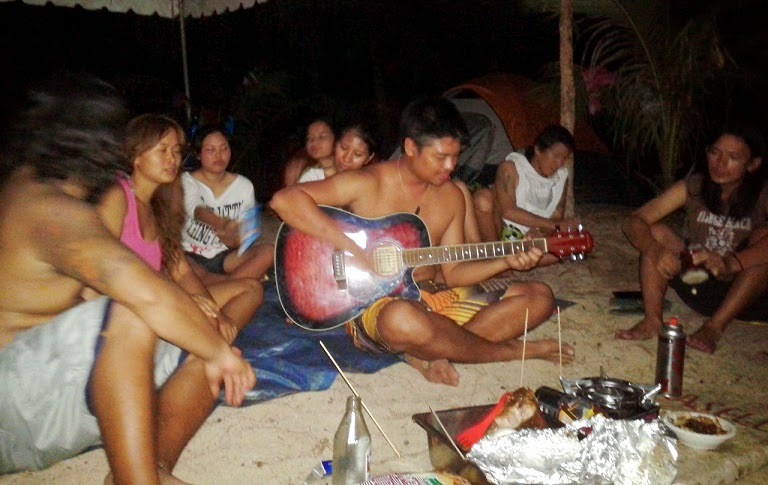 Until, I joined Red Chuca's (aka Adobo Journey) Jomalig Beach Bumming and BBQ Party! Red Chuca (event organizer) was the brain of this event. It was actually his post-birthday celebration. From his invite in facebook and after a series of second thoughts, I decided to join the group. A group of total strangers. From that perspective, it was already an adventure on my part. Imagine, being in an island with group of total strangers, without electricity and accommodation and you are 2 hours away from the nearest island (Pandanungan Island). This is a first for me and I had to be there! Per Red's itinerary, we met at Teleperformance, Greenfield District, Shaw Boulevard 11 pm. We were able to leave 12 am and proceeded to Real, Quezon. There were a total of 35 pax joining the tour and 3 vans were chartered for the event. The stopover was in Manggahan, Mabitac, Laguna. In all these options, you will reach Real, Quezon (128 kilometers from Manila). At Ungos Port in Real, ride a boat going to Jomalig. There is only one boat going to Jomalig per day. The regular schedule of the boat trip is 9 am and travel time is 5-6 hours at a speed of 14 km/hour or 4 knots. There are instances when the other boat leaves 2 pm or 12 am depending the availability of the passengers. From Real to Agta, Polillo, it is 37 kilometers. From Polillo to Jomalig, it is 42 kilometers. From Jomalig to Atimonan, it is 91 kilometers. 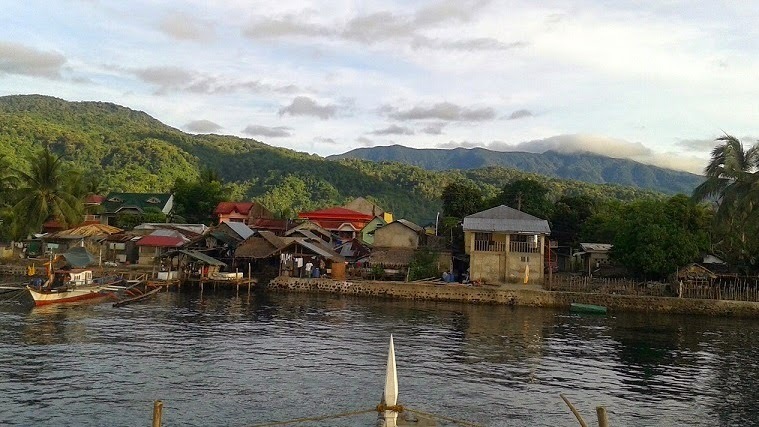 There are 6 operators of public utility boats in Real going to Jomalig. But one boat was hired for the event. The boat was owned by Captain Joel (0908-702-0806). We were supposed to leave 4 am but due to foreseen delay on the part of the owner, we left past 6 am. After 5 hours of sea travel, we reached our destination. Salibungot Beach! Jomalig was a sight for a sore eyes! Behold Jomalig! Although, It was raining profusely when we arrived at the island. I was still carried away by the splendor of the island. And we had to carry everything while it was raining. After an hour, the rain stopped. And we started assembling our tents and hammocks. In due time, everybody was able to finish assembling the tent due to the help of Red and Erwin. It was past 12 pm and Chef Arvin started cooking the sumptuous and overflowing lunch for the group. While others were busy preparing the meal, I decided to explore the island. It was a good thing that the rain stopped, the clouds cleared and the sun came out shining amidst the adversity of the previous rain. There was no stopping the group from enjoying this event. Our prayers were answered. Everything (except for the rain or it might be a welcome blessing after all) was perfect that day! We strolled along the beach and wandered around not mindful of where we were going, what lies ahead or that time was ticking away from us. In other words, we were enjoying our walk in the beach. The pristine waters and powdered white sand beach of Jomalig offered as a welcome sight for everybody! With the help of Francis, Red, Koko, Mayreen, Kat and the rest of the group, lunch was prepared and served. And the inevitable was about to unfold! After the sumptuous and belly-breaking lunch, I strolled once more in the beach to shed away some of the weight of the food that I consumed. After an hour, I decided to swim while watching the sunrise take its course. the sunset was breathtaking, captivating and majestic! After the sunset, Erick and I decided to lend a hand in the preparation for our dinner. I enjoyed grilling the food! and a whole lot more! A repeat of the belly-breaking lunch! What I did was to rise up early and enjoy the morning swim in the clear, pristine and cold water of Jomalig. Afterwards, we hired a boat going to Canaway sandbar for P2,000 good for 15 pax and after 1 hour and 20 minutes, we reached our destination. There are actually 2 islands called Canaway, namely: Canaway Laki (Big) and Canaway Liit (small). Our first stop was Canaaway Laki. Canaway Laki reminded me of the islands of Siargao! 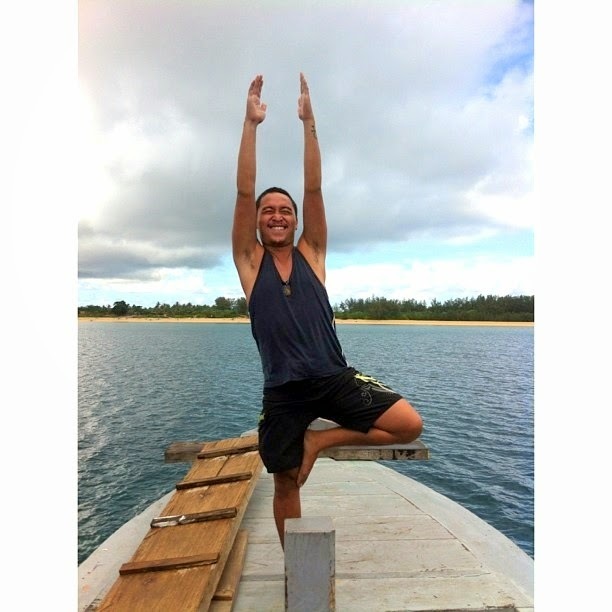 I joined Cara (of Travel Up), Erick and Ervin in exploring the island. The others did swimming and snorkeling. The scenery was simply majestic and overwhelming! After an hour, we hopped to nearby island - Canaway Liit. During low tide, there is sandbar formation which can be seen in the island. Everybody was busy taking their souvenir pictures while I was busy taking their pictures. And the day will not be complete without a jumpshot! We missed breakfast that day but we were overloaded with tons of fun and adventure. The ride itself was already an adventure for the group. Afterwards, we went back to Salibungot beach, broke our tents, brought our stuff back to the boat and bid goodbye to the island. We took our lunch onboard the boat, Again, thanks to Chef Arvin! After 4.5 hours, we arrived at Real and took our dinner at Eva's Canteen. Two days!? No! It is not! It was an eternity of fun, laughter and adventure that will linger in our minds. 1. There is no electricity in the island, it is better to bring your power banks. 2. There are mobile networks in the island but internet connection is not that good. 3. There are no lodging facilities in the island. No tent or hammock rentals available. 4. You have to coordinate with the local government officials whenever you are going to set up your tents or hammocks in the island. 5. There are comfort rooms in Salibungot Beach but water is not available. The cost of one pail of water is P10.00. 6. In Saibungot Beach, sunrise is on the opposite side of the island but sunset is facing the beach. 7. Motorbike rental going to Canaway Sandbar costs P500-800 and is good only for 1 person. Boat rental costs P2,000 and is good for 15 persons. 8. There are no branded liquors in the island. Only lambanog. 9. Since there is no electricity, it is better to bring your flashlights. 10. Coordinate with Tita Malou and pay the environmental fee of P50.00 Enjoy Jomalig! Hi. Would you know the schedule of the boat going back to Real? Normally. after they arrive would leave but as to the specific time, I ma not aware of. sir pano kayo nakapagdala mga lutuan at malaki fish? galing pa ng lucena yun fish? sir regular b ung cargo boat or chambahan lng..sabi kc saken ni kuya danny ung guide nyu sa real.kelangan daw mag patnanungan muna.then jomalig. Ask ko lang po. Magkano po yung bayad niyo sa bangka, saka kung isang bangka lang po ba siya hanggang jomalig na? Pati po yung capcacity? Need po malaman asap para mabudget po agad. Hehehe. Thanks! Php 300 pesos po ang regular na pamasahe mula real to jomalig. One way lang po ba yang 300? Honestly, there is NO definite time of departure. Better be at the port 7:30 am and make the necessary inquiry. During peak season, they have 2 schedules, one at 9 am and the other at 12 noon. BUT the boat leaves the moment it is FULL. hi i wonder if there's a regular schedule of boat ride to the island if i were to go alone... i'm planning to stay out of the city on June 11... thanks! Possible sir, go directly sa salibungot beach. Ask Kuya Jojo (with and injured eye) and he will assist you, sabihin mo lng name ko Glen :) (yabang lng) kagagaling lang nmin dun and we are 59. Good day, Matanong ko lang po, How much po ang per head ng bangka going Jomalig?? yung fare If im not mistaken wal pa pong P200. Pwede pong magtent. Pwede din pong may cooking set. may cr po. Not necessarily po, you can wait po for the boat ride. Hi! Would you recommend Jomalig to kids aged 10, 12 and 15? And also going there on a Holy Week or madami masyado tao? Thanks in advance for your reply. Thanks a lot for your reply! Appreciate it so much. i enjoyed reading your blog. very informative and i like the simple words that you used. more power!!! Sir balak po kasi namin pumunta dyan ngayong holy week, di po kaya sya crowded? at di po kaya tataas yung fare sa boat papuntang jomalig? at magkano po? how many hours po sir from real to jomalig?byahe ng boat po gano katagal. mas malapit po ba salibungot beach thanks..
Sir. Ilang days ung 2500 na package? hi sir! 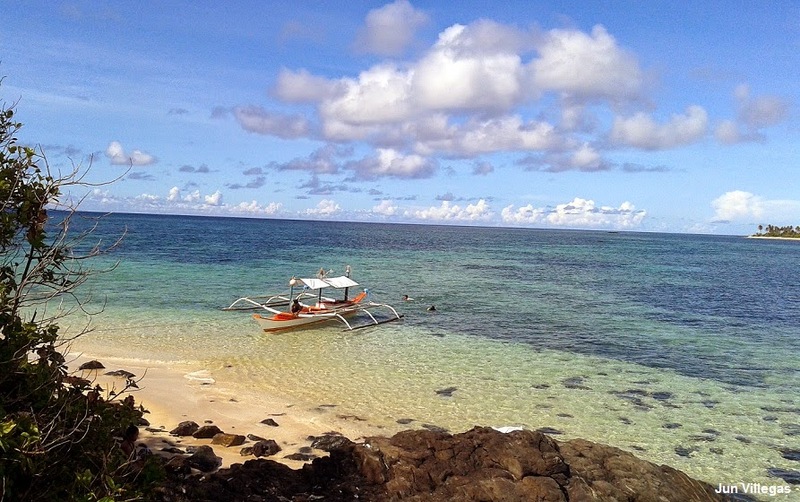 we're planning to visit Jomalig Island this coming weekend, do you know the schedule of boats from Jomalig to Real? Nice blog Sir very informative. TIA! Sir Jun, how much po budget sa for this coming May 13-15 for jomalig po? thanks! and what time po aalis ng May 13? at what time po expected return to manila ng May 15? Just want to ask sir pag 2 to 4 person magkano magagastos each person? ang saya magbasa ng blog na to.. parang gusto q na rin pumunta.. ok lang ba alone? Is it advisable to go there this coming holy week? I mean, riding a bus? 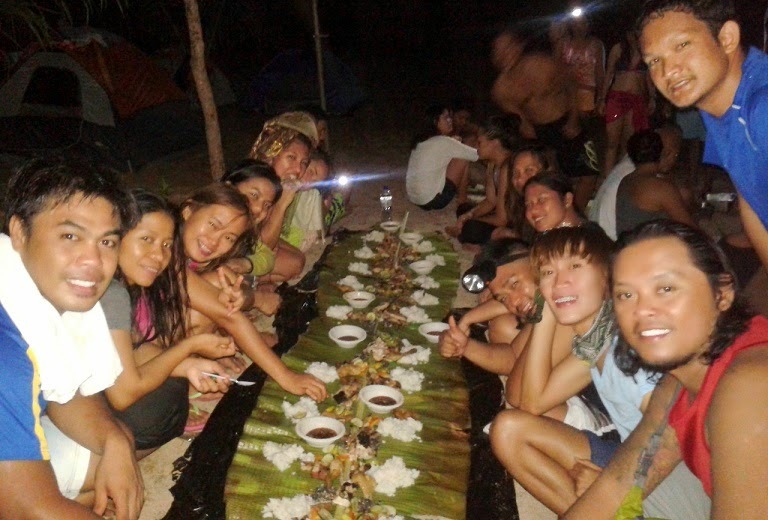 Ang saya ng boodle fight nyo sir, ang dami nyo. May fee kaya kung gagamitin ung kubo ung sa little island sa may kanaway?